My rebel 250c did the same thing. Weird pixelated screen.. then a white screen.. reboot it would work but come back. I contacted evolv and they issued an rma. Obviously they are having issues. i just went through this with my Rebel 250c. The board has to be replaced. Evolv is aware of the issue and needs all those boards back to figure out where the problem came from. Contact Evolv and submit a ticket. They will issue a RMA and you have to send the mod to them (at your own cost). It took mine 2 weeks to get the board back but it is no longer not waking up from deep sleep. AGAIN. This is not a firmware issue. This is a hardware and has too be replaced. 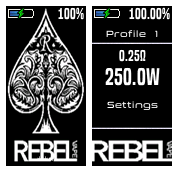 It is not centered around 1 mod maker either as mine was from a Rebel DNA 250c Ally Black. Hope this helps! ATTENTION Hey guys. Im not sure if this has vbeen addressed yet but it IS a faulty board. Contact Evolv and let them know. I had it happen to my Rebel 250c. It is a known issue and there is no fixing it. This is an issue with the board and evolv will replace it for free. They want all these boards so that they can figure out how it happened. I did notice that now that i have a new board my fire button seems to be "more clicky", I think that is where the issue lies but it has to be replaced by evolv.